Bucky Sligo was an Irish-American linked to criminals in Alderney, Dukes and Ireland. He was an associate of Derrick McReary and Aiden O'Malley. Sligo was suspected in a string of robberies for which O'Malley was convicted, yet the charges did not stick. Afterward, Sligo often spoke of McReary as a rat and threatened to kill his family, driving McReary deeper into heroin use and depression (possibly because Sligo's claims were true). 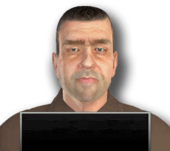 A down-and-out McReary sent Niko Bellic to kill Sligo. Bellic tracked him down to a Burger Shot restaurant in Westdyke, Alderney; Sligo escaped in his car, retreating to the house where he was holed up with several armed accomplices. A shootout ensued, Niko killing Sligo and the accomplices. Affiliations: Linked to Criminal Underworld in Ireland and Irish American criminals based in Dukes and Alderney. Associate of Derrick McReary and Aiden O'Malley. Suspected in the string of robberies for which O'Malley was convicted but, despite McReary's testimony, charges did not stick. Recently suspected of running a small time car stealing and larceny operation in Alderney. Bucky's gang members are the exact same model as Irish Mob affiliates. Bucky drives a black Contender and his radio is always pre-set to Liberty Rock Radio 97.8. Bucky's appearance is always different and it's possible, that he does not bear any resemblance to his portrait in police database. (Ex. Glasses, Mustache, Blue T - Shirt and Blue Eyes. Sligo is a town and county and in northwestern Ireland and is twinned with Tallahassee in Florida, which refers to his Irish-American history. He has the same facial texture as Little Italy Taxi drivers. This page was last modified on 26 October 2013, at 19:13.